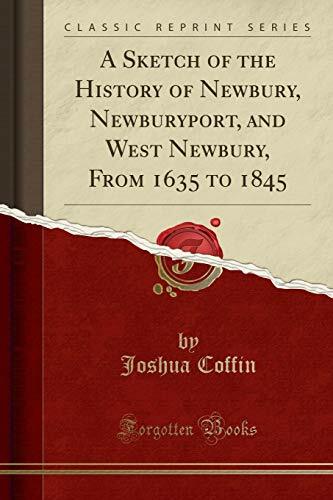 Excerpt from A Sketch of the History of Newbury, Newburyport, and West Newbury, From 1635 to 1845<br /><br />Those who are familiar with ancient mythology, will recollect the story of the good Isis who went forth wandering and weeping to gather up the parts and fragments of her murdered and scattered Osiris, fondly yet vainly hoping that she might recover and recombine all the separate parts, and once more view her husband in all his former proportions and beauty? With equal assiduity, but with far less lamentation, has the compiler of the following pages been for many years engaged at intervals, in collecting the scattered fragments of Ould Newberry, and has arranged his imperfect materials in the form which the now exhibit to the reader.<br /><br />About the Publisher<br /><br />Forgotten Books publishes hundreds of thousands of rare and classic books. Find more at www.forgottenbooks.com<br /><br />This book is a reproduction of an important historical work. Forgotten Books uses state-of-the-art technology to digitally reconstruct the work, preserving the original format whilst repairing imperfections present in the aged copy. In rare cases, an imperfection in the original, such as a blemish or missing page, may be replicated in our edition. We do, however, repair the vast majority of imperfections successfully; any imperfections that remain are intentionally left to preserve the state of such historical works. Bartlett is a partner at Morrison &amp; Foerster, a law firm that represents many startups, and an adjunct professor at New York University School of Law.